DAY 8. Saturday, and the final day of racing. 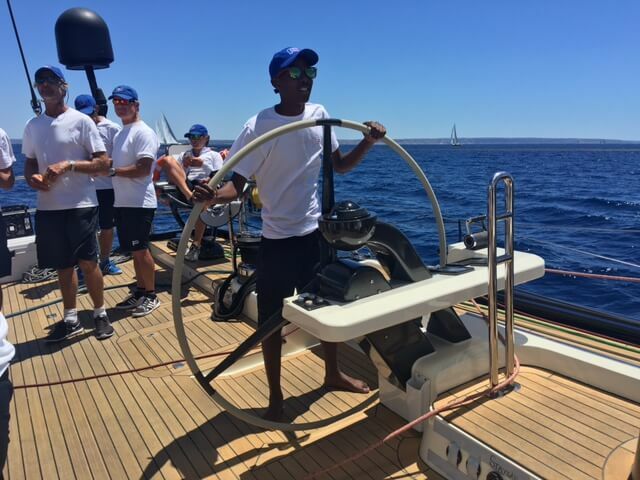 Bohlale and Luyolo stayed on their boats, P2 and Mariette respectively, and then Win Win offered Loyiso a place for this last race. What a good choice this turned out to be…! Today there was a bit more wind and we had a crowd out on the Aloha J to watch the racing. 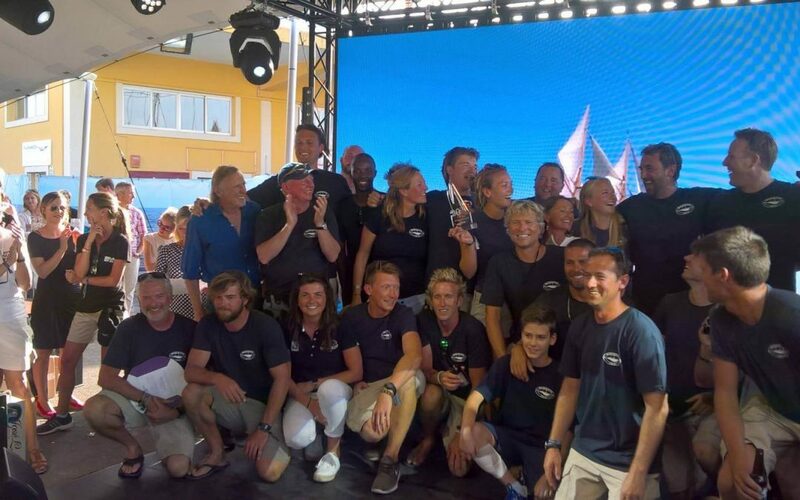 It turned out that Mariette and P2 won their classes and “Win Win” won the whole regatta. The owner of Win Win made his acceptance speech and talked about Marine Inspirations, having invited all three of our boys up onto the stage. All in all a very successful regatta for us and the boys and we have inspired others to come forward with offers to help our small organisation and initiative. Check out the Super Yacht Cup website for more information and details of the racing. DAY 9. The boys were totally exhausted after three days of racing out in the hot sun, so elected to have a Sunday sleep-in onboard the Aloha J. Mid-morning Luyolo cooked breakfast and then they came up to the Wades’ house for a trip to see Phil’s “Goat House”, a weekend retreat/olive farm in the mountains behind the mountain village of Alaro. We threw some ribs onto the BBQ and admired the view, then down for a refreshing drink in the church plaza in the centre of Alaro. Home for an early night. DAY 10 Monday, June 27th While waiting for confirmation of appointments for the youngsters to visit various service institutions in Palma, Anthony took the boys up to see the historic 14C Bellver Castle overlooking Palma Port and then to Puerto Portals harbour, outside of Palma, where they got to see another small town and a significant and upscale marina complex. They were also welcomed by the local yacht broker Nigel Wales from Arrival Yachts and given an talk about how that side of yachting ‘purchase and sales’ works. 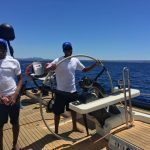 After their yacht visit and a light lunch of local tapas and ‘pa ‘amb oli’ they were taken to the HQ of Omniaccess SL, located in the ‘silicon valley’ of The Balearics at Parc Bit. OmniAccess is the leading supplier of Vsat satellite communications and marine onboard IT networking solutions to many super-yachts and ships worldwide. 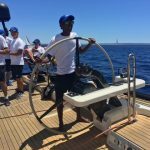 A further yacht-visit followed with a trip to the Real Club Nautico to tour the very fast and record-holding modern classic 46m schooner “Windrose of Amsterdam” – built by Holland Jachtbou to Gerry Dyjkstra design in 2002. 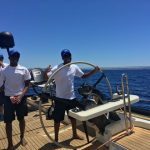 The evening brought further excitement, as the boys prepared the schooner “Aloha-J of Cariba” and took her sailing in Palma Bay for the night. They conducted all operations: starting engine, leaving harbour, navigation, sail manoeuvres, anchoring, cooking dinner, washing up, standing watch, and returning to port at dawn and docking the yacht – on their own, but under the watchful eye of Anthony. During the night squally and rainy weather passed through Mallorca, and the yacht returned to harbour in the rain. DAY 6 Thursday 23 rd and the first day of racing. 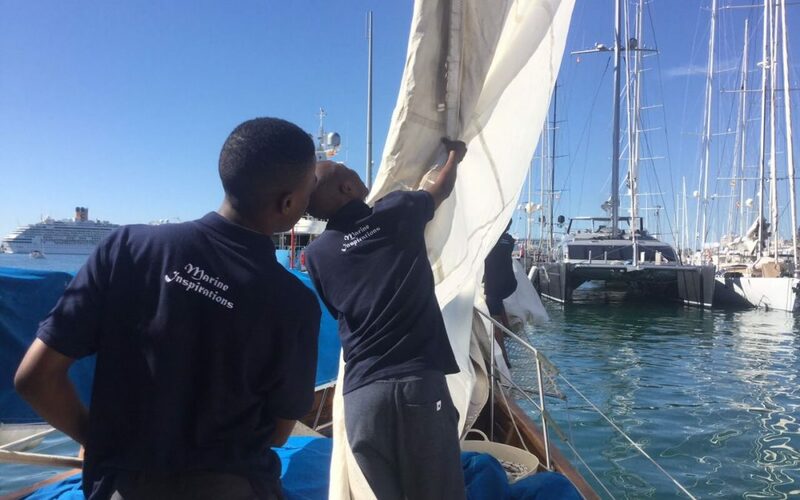 Buhlale was on P2, Loyiso on Tenaz and Luyolo on Mariette, the classic schooner uilt in 1915. It was a fine day of racing, blue skies and a light to moderate sea breeze in the afternoon which saw both P2 and Mariette winning their respective classes. The boys partook in the after race BBQ and then back to Aloha J for sleep. DAY 7 Another beautiful, but hot day with light winds. The sea breeze kicked in again in the afternoon as usual in the Bay of Palma and yet again P2 and Mariette won their class. It was a long day on the water and the boys went back to Aloha J right after racing, totally exhausted but with big smiles on their faces. 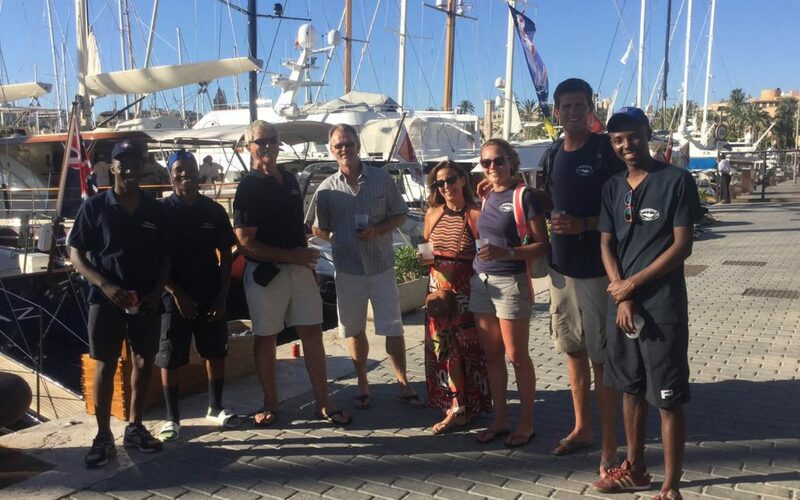 After an exciting day of racing in Palma Bay with each of our young men sailing aboard three different yachts, “P2”, “Mariette”, and “Tenaz”, the crew gathered at the Regatta Village for a debrief, dinner, and a musical evening – meeting and chatting with many of the other participants. 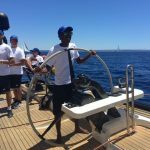 DAY 5 The plan was to take Aloha J out sailing and watch the 8 classic schooner doing a parade in front of the Cathedral but at the last minute the captain of P2 said that the boys should come out with them on practice day in order that they get familiarised with the boat. A good decision. 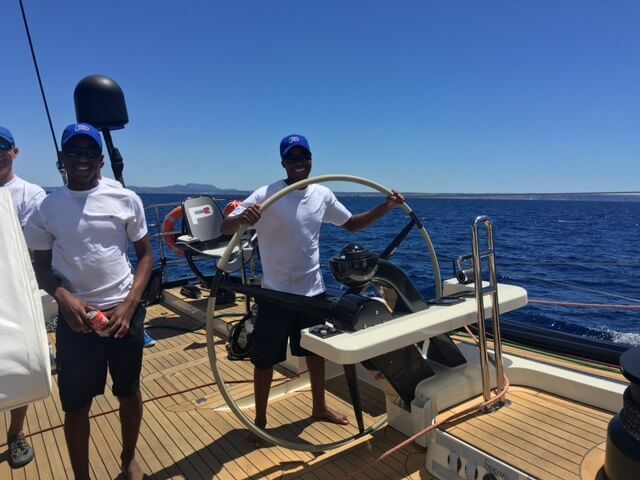 We still took Anthony’s boat out with MI supporters and friends and what a sight it was with perfect conditions. The boys came back totally exhausted and had a very early night with big smiles on the faces. You can read a bit more about P2 by visiting their website. 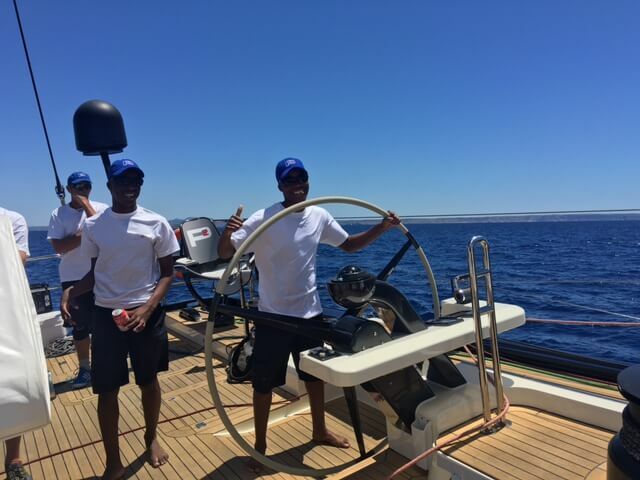 DAY 1 The boys, Luyolo, Buhlale and Loyiso all arrive on time here in Palma at the start of their 2 week adventure. 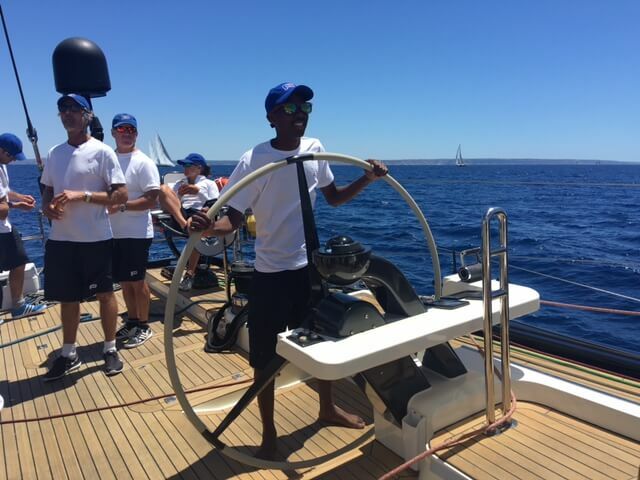 Anthony took them straight to “Aloha J of Cariba” the 24 meter schooner which will be their home while they are here. After a quick shower we took them to an “all you can eat” Chinese restaurant which made a big impression, after which they retired to the boat for an afternoon snooze to recover from their flight. This is the first time any of them had been into an airport, let alone on an aeroplane or out of the country! DAY 2 Being Sunday it was a slow start followed by some knot tying lessons and a touristic walk around the old town of Palma. Dinner was home smoked chicken on the Wade’s roof terrace, enjoyed by all. DAY 3 The day started with an interesting visit to Master Yachts, a yacht management company responsible for many very large yachts world wide. Thanks Rob and Richard for this which the boys really enjoyed. From there we went aboard Mia Cara, a 39 meter sail boat which is out of the water doing a major refit. Lunch was “do-it- yourself” sandwiches at the Wade house and then a visit to isione”, a 45 meter super yacht specifically built for racing. An amazing machine, ultra light and very fast and a big contrast to Mia Cara and Lady B, our next visit. Lady B is also 45 meters but a luxury charter sailing boat designed by Ed Dubois. Peter the captain and Etienne, a fellow South African gave them a great tour and each got a turn going up the mast in the hydraulic crow’s next. Anthony took the boys out for dinner and an early night after a long day. 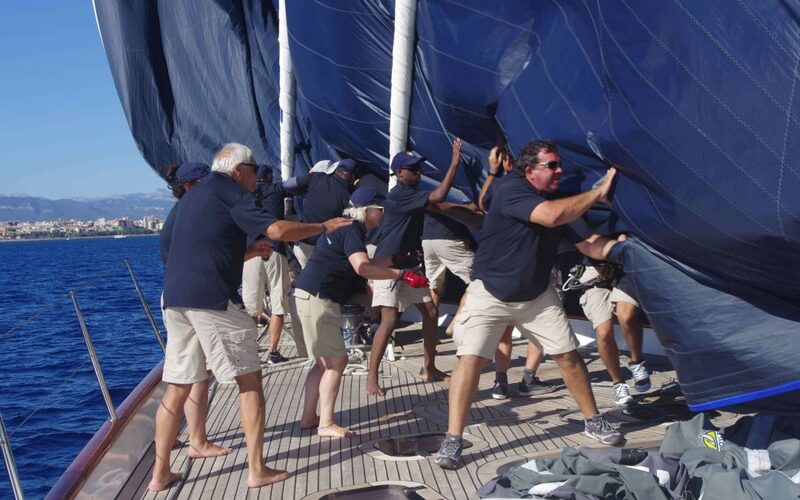 DAY 4 Anthony needed some help preparing the good ship Aloha J so the boys were seconded and got some valuable hands on experience taking down the headsail and making repairs. They then made their own lunch on board and came back to Santa Catalina for a visit to Deckers Uniforms. This sounds a bit boring but it is really interesting to see how big this business is and a good lesson in logistics. The boys were fascinated by the rows of embroidery machines doing 2000 stitches a minute! David Ireland the owner gave them a really interesting tour or the shop and work shop. Laureen (“Law”) Phil’s niece is here visiting from London to help out and she wanted to do her bit by taking the boys out for a pizza last night.